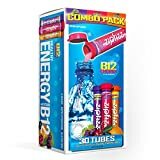 ZipFizz Energy Drink provides a number of products (powder, liquid shot, and immune fizz) that are very high in a number of vitamins and nutrients. The signature product is a tube of powder that can be added to 16-20 ounces of water. A tube contains 100mg of caffeine - but will obviously dilute depending on the amount of water the powder is mixed with. All flavors of Zipfizz energy drink have the same caffeine amount, which is extracted from Guarana seed and Green Tea. Each tube contains 2500mcg of Vitamin B12 - 41,667 % daily recommended value! ZipFizz RTD Shot contains 120mg of caffeine per 4 fl.oz. bottle. Immune Fizz contains zero caffeine. 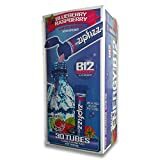 One of the most unique forms of energy drinks I have seen is ZipFizz Energy Mix. Combining the convenience of a compact mix and the power of an energy drink, they are certainly a different approach to getting your caffeine fix. As with the rest of ZipFizz's lineup, there is an emphasis on healthy, sustained energy. Some drink mixes can be a hit-or-miss thing as prebottled versions can have a better taste, so it will be interesting to see if ZipFizz mixes can compete among the growing selection of energy drinks. I had the opportunity to review 5 flavors of this mix. Each were mixed in the recommended 16oz of water, so none tasted overly intense or diluted. Citrus – A sweet-and-sour concoction that tastes more like lemonade than just “citrus”. Orange Soda – Great orange taste very similar to a juice mix from concentrate. Pink Lemonade – Like citrus, except with stronger flavors. Has a sweet and sour bite to it that I really enjoyed. Grape – Tastes like grape concentrate, like what you'd find in a juicebox. Berry – Almost exactly like a juice mix from the grocery store. Nice bit of tang as well. All of these had a funny fizz to them, almost like “fake” carbonation. These mixes contain a 317mg proprietary energy blend including guarana, ginseng, ginger root, grape seed extract, and select amino acids. They also include a full list of vitamins and minerals that serve as electrolytes, making this a healthy energy mix for sure. Ginger root is not something too common in energy drinks, so it'll be interesting to feel its effects (or perhaps lack thereof)! These mixes all provide an excellent boost, mentally and physically. It doesn't come on too strong, rather being more gradual and mild. I don't have any nasty jitters, which is cool. Ideally this would be great if you want a head start to your post workout recovery or a supplement for the mid-day slump. The ginger root could have a role in taking the edge off the caffeine. However, if you're pretty tolerant to caffeine or want a big rush, this wouldn't be the stuff to achieve that. ZipFizz mixes are a healthy and convenient way to get your energy fix without having to suffer through any nasty taste. I'm definitely going to have a few of these around for those trips to the gym. (ZipFizz Citrus) Citric acid potassium carbonate, natural flavors, calcium ascorbate, magnesium glycinate, xylitol, potassium bicarbonate, glucose ploymers, sodium bicarbonate, acesulfame potassium, guarana seed extract, L-arginine, potassium citrate, L-taurine, silica, sucralose, niacin, zinc amino acid chelate, grape seed extract, manganese gluconate, d-alpha-tocopheryl acetate, green tea leaf extract, alpha-lipoic acid, pyridoxal-5-phosphate, chromium dinicotinate glycinate, cyanocobalamin, D-calcium pantothenate, American ginseng root extract, ginger root, selenium-L-methionine complex, riboflavin-5-phosphate, thiamin hydrochloride, and folic acid. How Does ZipFizz Energy Drink Compare? ZipFizz Energy Drink contains 6.25 mgs of caffeine per fluid ounce (21.13mg/100 ml).